It has been quite a while since my last blog post here. I have been in Portland, OR for a full two years now, and much about me has changed. Music is still a pretty important part of my life, but I no longer play or write any music on a regular basis. Last summer, my father passed away and I haven't been very successful in any of my creative endeavors since. I suppose I have taken to photography, and that has been a very useful creative outlet for me, but I fear that it is not enough. 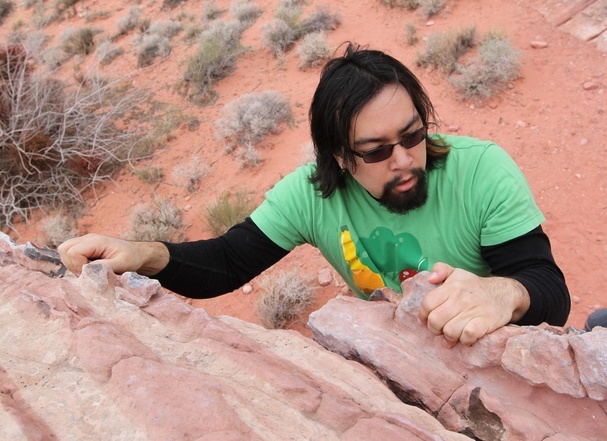 Last spring (2009), one of my friends asked if I wanted to go to a climbing gym with him. There had been one time, roughly four years ago now, that I tried a climbing wall but didn't like it. I told him of my skepticism, but he was convincing. For whatever reason, I loved it. The Circuit bouldering gym has become one of my favorite hang-out spots and climbing is one of my primary passions in life. I've been sick for the past week and what makes me feel even worse than the sickness is my inability to go the gym to climb. It's also one of the reasons why I need to leave Portland, eventually. To be closer to good rock and good weather. Plus, the constant cold and rain during the winter is super depressing here. It's good to have found a passion in life. I've been doing the software engineer thing for the past two years (move to Portland for this job) and it is.... adequate. I don't love it, but I don't hate it. It's just mentally stimulating enough to keep me from being bored most of the time. Once I have 3-5 years of experience, I'll find something more interesting and more intellectually stimulating to do. Or become a dirtbag climber and travel the world for a while. Or teach English in Korea. Good God, I have no idea what I want to do next in my life. There are so many options. I love it. It's difficult to figure out what to write in this space. There's so much that has happened since my last post.... but really, how could I condense everything? I spend my time working, climbing and playing board games with friends. I guess that's a good a summary as I can think of. I shall try to write here more often, and become active on this site again.... but we'll see how that goes. Best wishes to any of you who may read this.